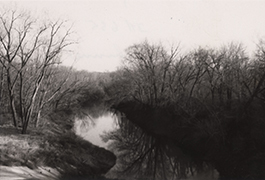 The Edward C. Fritz papers, 1950s-2008 digital collection contains 361 documents and photographs that record the 1970s debate over the canalization of the Trinity River, just one of the many environmental causes for which Edward C. "Ned" Fritz (1916-2008) campaigned. 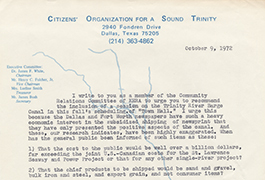 This digital collection highlights items associated with the sequence of events surrounding the Trinity River Project debate. 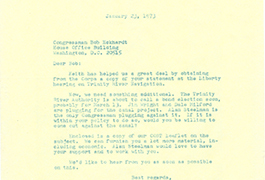 The items span the period from 1966, when Fritz was serving on the steering committee of the Texas Committee for a Balanced Water Plan, to 1979, when the Army Corps of Engineers' report deemed the canal economically non-viable. Fritz was a Dallas lawyer whose dynamic environmental activism earned him the title, "father of Texas conservation." From the foundation of Dallas in the 1840s, entrepreneurial occupants aspired to tame the unnavigable Trinity River and put a barge transportation system in place as a cheaper alternative to rail. 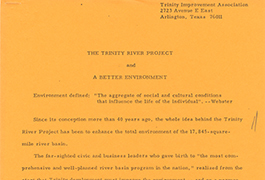 The Trinity River Project was an initiative championed by Texas businessmen and politicians in the 1960s and '70s. With the support of the federal government, they offered a suite of flood control, water supply, and recreational improvements to Dallas/Fort Worth-area residents on the back of plans to reconstruct 552 miles of river into a 335-mile commercial waterway, stretching from Fort Worth and Dallas to the Gulf of Mexico. The large-scale dredging, damming, and restructuring of the riverbed was estimated to cost the federal government and local taxpayers over $1.25 billion. Anticipating large-scale environmental destruction coupled with rising property taxation -- and critical of the vested interests of the businessmen and landowners behind the project -- Fritz and fellow opponents formed the Citizens' Organization for a Sound Trinity (COST). The group, toting the slogan "Our dollars; their ditch," rallied local residents to vote against the project when it went for bond election. Ballot sheets of March 13, 1973, recorded a landmark victory when the voting majority of the seventeen counties in the Trinity River watershed rejected the bond proposal, denying the local share of the project funds and signalling the end of the prospect of the Trinity River Canal. Despite the outcome, Congress continued to appropriate funding for non-navigational aspects of the project and canal proponents made subsequent attempts to progress plans for channelization throughout the 1970s. COST, and supporters, persevered. 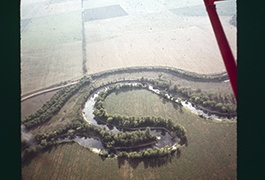 Finally, in 1979, a leaked Army Corps of Engineers' report revealed findings that a navigation channel of this kind on the Trinity River was not economically justified. Fritz started donating his papers to the DeGolyer Library at Southern Methodist University in 1986 until there were more than 145 boxes of materials. The Edward C. Fritz papers, 1950s-2008, (bulk 1970s-1990s) has an estimated 425,000 pages in total. It is divided into 33 separate series and documents his environmental work across Texas and the nation. A finding aid is available for Ned Fritz's papers, which are held at SMU's DeGolyer Library. The online collection was digitized with funding from the Great Western Library Association (GWLA) and also is part of the Western Waters Digital Library. 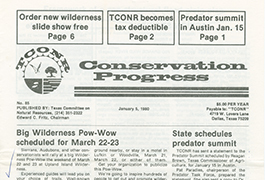 The collection includes community organization newsletters, campaign material, photographs, slides, maps, legal documents, reports, press releases, government documents, and political advertisements. The selected materials are from boxes 114, 116 and 117 of Series 29: Water and box 142 from Series 32: Photographs and Slides.